Argentina’s top sommelier Paz Levinson went through to the semifinals of the Concours A.S.I. du Meilleur Sommelier du Monde Argentina 2016 last night – the only Latin American candidate to do so and one of four female somms. Who’ll become the best sommelier in the world? While Team Argentina anxiously awaited results that would slash 60 sommeliers to 15 for the next round in Mendoza, Levinson’s entry was frankly a given; in 2015, she took first place in the stringent Americas’ competition. Tough written and practical tests await Paris-based Levinson and her 14 competitors; the first round consisted of a 60-question multiple choice paper and Champagne service. Host nation Argentina’s second candidate Martín Bruno didn’t make the next round. 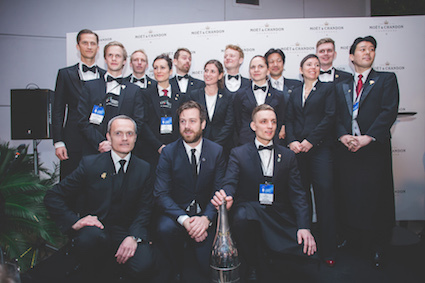 The 15 semi finalists were revealed by former world’s best somm 2010 Gerard Basset OBE MS MW MBA at the Park Hyatt Mendoza, albeit in no particular order. Japan, Sweden and its Nordic neighbours fared extremely well with two candidates from the latter two countries reaching the next round.